First we need to create a square image, for this tutorial I'm using a 4 pixel square image, as you can see from the screenshot on the left I've zoomed in on it so its 800% so its easier to see what's going on. Now select the 'pencil tool' and use the smallest brush (1 pixel), select a colour, and draw a line at the top and on the third pixel line down. This square will repeat its self over and over again so its important to have black - white - black - white although you can experiment with bigger squares and try different variations e.g. double and single lines. Now we need to 'define the pattern' to do this either go to 'select' and from the menu then select 'all', or press Ctrl + A on the keyboard. Now at the top of the screen and click on 'edit', then select 'define pattern' this makes a copy of the selection. 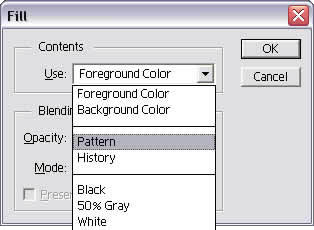 Next select the image you want to add scanlines to, create a new photoshop layer above the image and go to 'edit' then select fill, this will launch a new menu panel as shown on the left, scroll down in the 'Use' section, and select 'pattern' then click on OK. This will fill the new photoshop layer with the defined pattern. Now all we need to do is remove the white lines from the filled photoshop layer. Select the magic wand from the photoshop tools palate and in the options section, turn off anti-aliased and type 0 in the tolerance section. Now click with the magic wand on one of the white lines, then go to 'select' in then 'similar' (this will select all the white lines) then Ctrl + X or from the edit menu select cut. You should now just be left with the black scanlines over the image. You can now alter the opacity of the scanlines layer to make them faded.